← At thirteen degrees north, a long way from home. 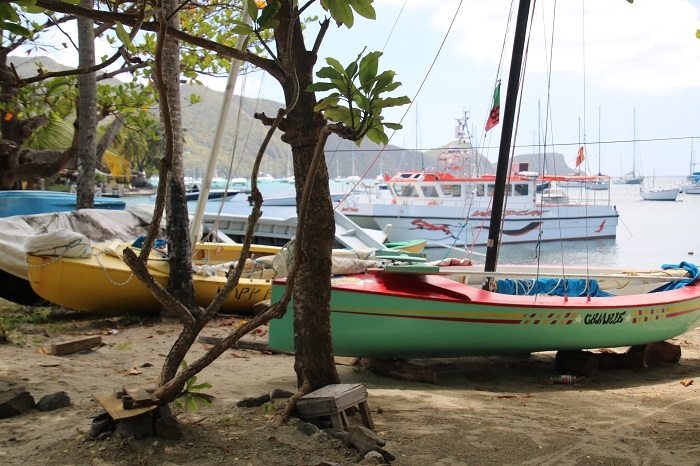 Bequia has long been known for its fine craftsman, artists and the building of boats, both model and full size as well working on boats like ours that visit the island. 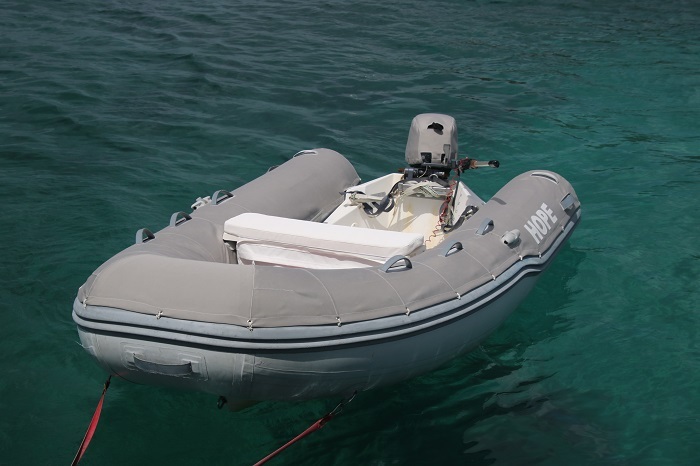 Owning a boat requires a constant investment of time and money as it’s the only way to avoid waking up one day only to realize that you are living aboard a “fixer upper”. 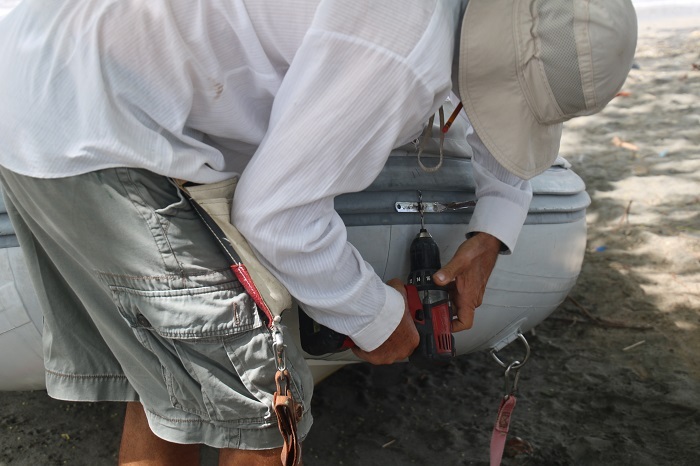 Boat ownership is all about being focused on “fixing her up” so she stays looking good. We were told that there are some excellent craftsman here on the island and had planned to have some work done while we visited. In particular, we hoped to have canvas covers or “chaps” made for our dink. The blazing tropical sun is pretty tough on everything and an inflatable dink is particularly susceptible to decay. Having one of the better brands like Caribe, ours, does help as they are made with high quality Hypalon but even the best materials will only hold up just so long with near year round use. So, with that in mind, we decided to have a custom canvas cover made here in Bequia. 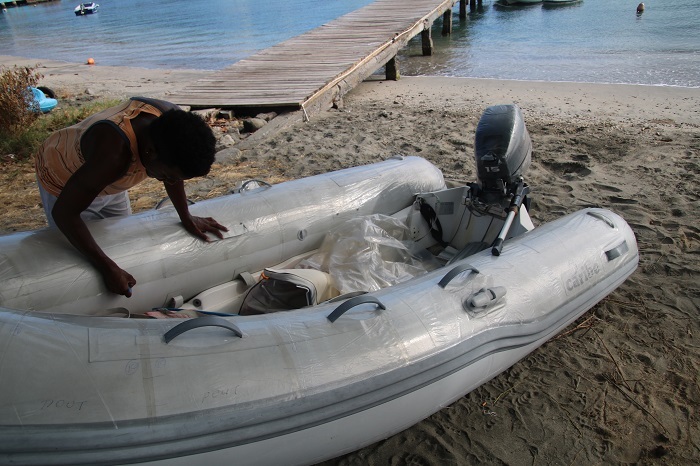 We had heard good things about Grenadines Sails and Canvas so I contacted them about the job. Amazingly, when I showed up they were ready to go and within 24 hours I had installed chaps. I also had them make a new seat cover, engine cover and lift straps. Ok, so remember the whole “Pandora’s Box” thing? You know, she opened the box and let out all the evils of the world? Well, according to legend, all that was left in the box was Hope. Get it? Pandora’s Box, Hope? Pretty clever? So, our dink is now officially Little Hope. However, that was just too many letters to fit so Hope it is. And, “hopefully”, pun intended, Pandora’s dink will now last a lot longer with her snug fitting canvas cover. The bad news is that now I have yet one more thing to try and keep clean. Oh well. Nice dink though. I’d better be sure and lock it up, always so it doesn’t somehow become somebody else’s Little Hope. 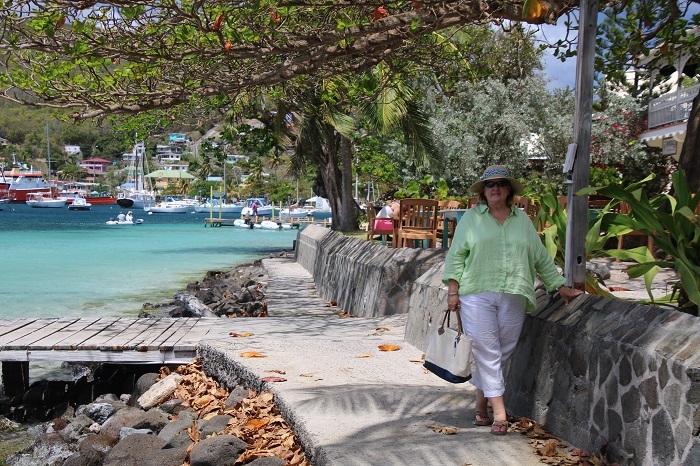 Canvas work is just one of the excellent products that are produced here in Bequia. 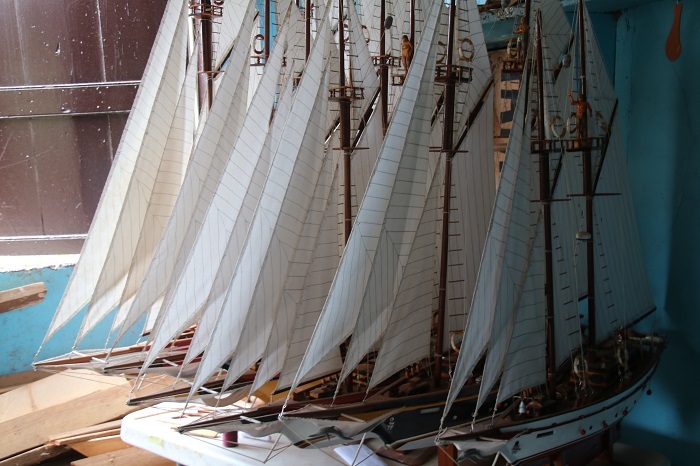 There is also a long tradition of building boats and model boats and there are still a number of craftsman that are continuing the tradition. 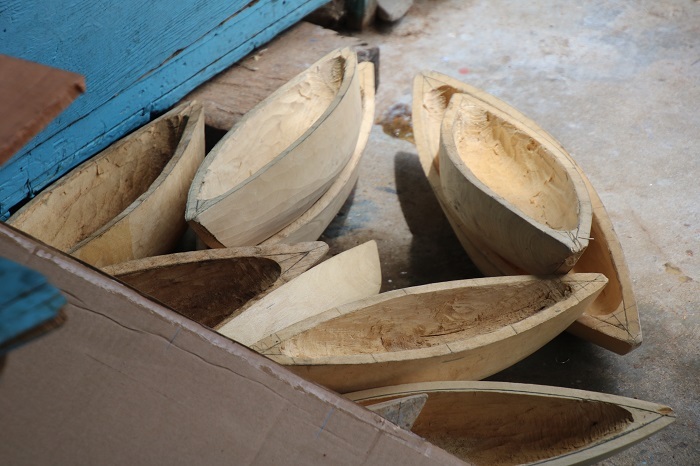 The model boats are actually carved out of a log from a native tree. 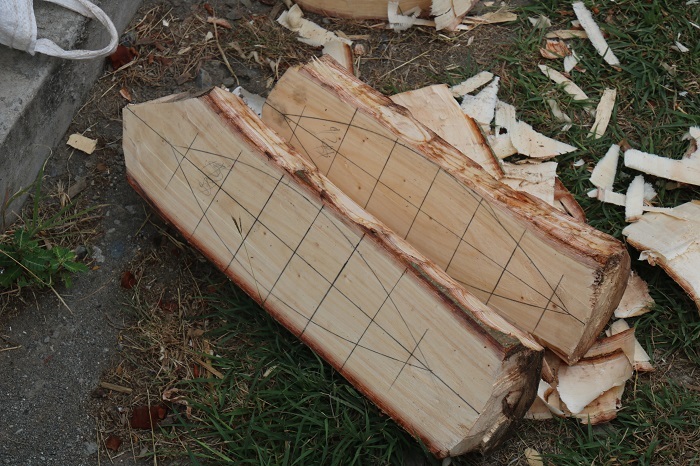 After marking up the log they carve it into a rough shape of the hull. And, after a while, a finished model boat. Many actually. Some are of famous yachts and you can also commission a model of your own boat. 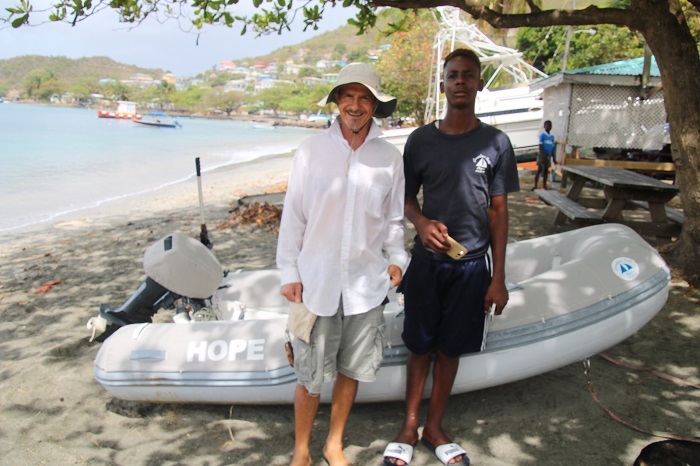 However, the bulk pf the models are of the traditional working boats of Bequia, in particular, those used to hunt whales, which is still legal, if tightly controlled. 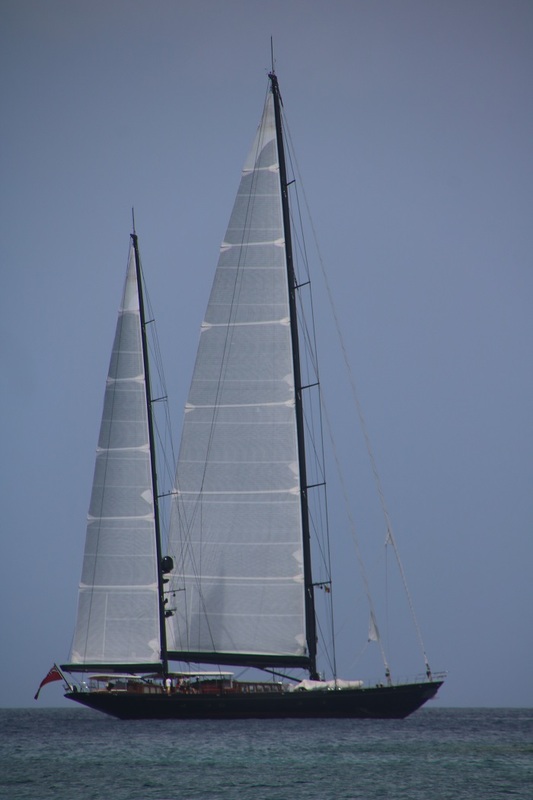 They hunt, using only sail powered boats, and harpoon a few humpback whales each year along with a number of smaller pilot whales. As you’d expect, where there are whales, there would be things made from whales. 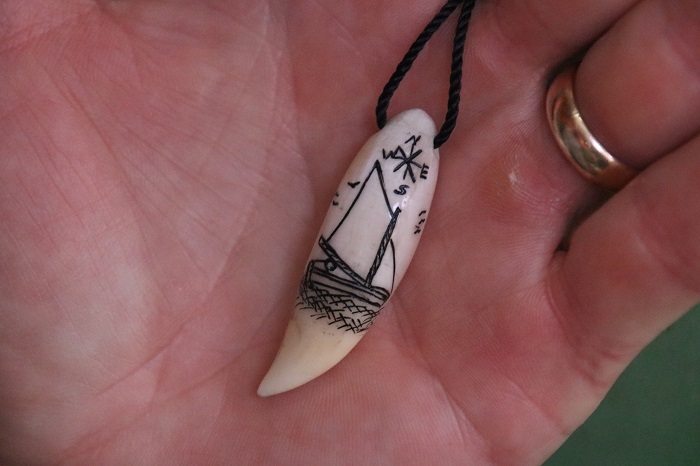 We saw the work of a local craftsman and asked him to make up a scrimshaw of a traditional Bequia sailboat on a pilot whale tooth. Pretty neat. It’s the closest I’ll ever get to a tattoo. There is tradition of boat building and they still race them aggressively. Nice looking boats. Now for a few random items. 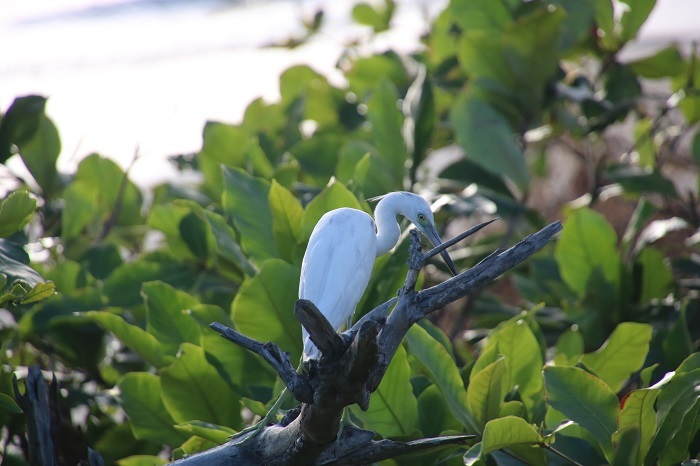 How about a pretty heron? Brenda and I enjoyed walking along the seawall. There are a number of nice places to eat along the way. 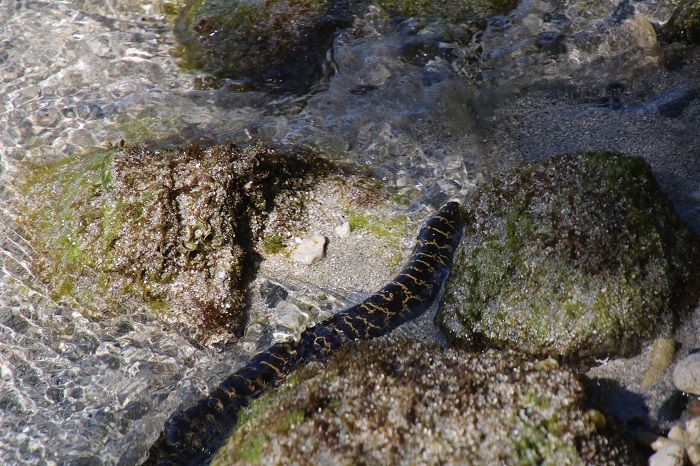 Right near the walkway we spied this moray eel swimming in the shallows. The water in the harbor is quite clear. And, under the category of “multi-talented”. How about this sign for an gallery/doctor office? The same guy, BTW. I wonder if this guy’s dink has new chaps? Canvas covers for his helicopter, more likely? For sure. Several years ago we sailed on this huge ketch Marie. She’s here too, along with a few other massive sailboats. It seems that she was here for some informal racing against several other “big girls” today as they all left at the same time and milled around for a while before they took off. I was hoping to stop by later and see if any of the crew that we met are still around. The experience of sailing on such a magnificent yacht was something else, let me tell you. You can see a number of posts about this experience but click here to see one about a party aboard that we went to. Want to see some of the up close shots of Marie? Click here. 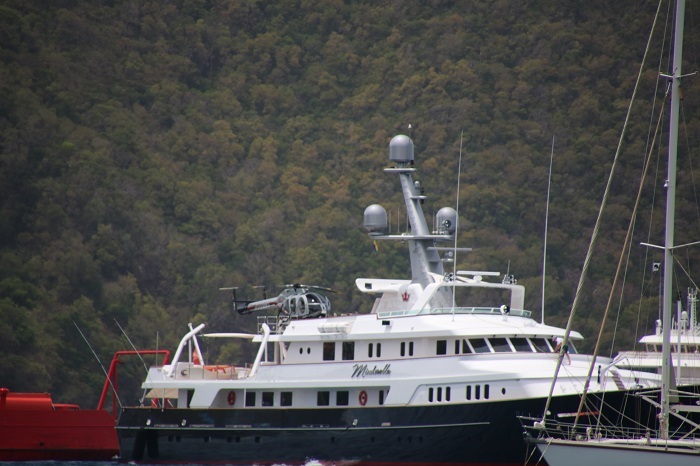 It would sure be great to be aboard her again and it was fun to talk to some of the other cruisers we saw last night when they remarked, “did you see that huge ketch Marie?”. “Yes, we did, and we have sailed on her.” They were impressed. And we were too, let me tell you. 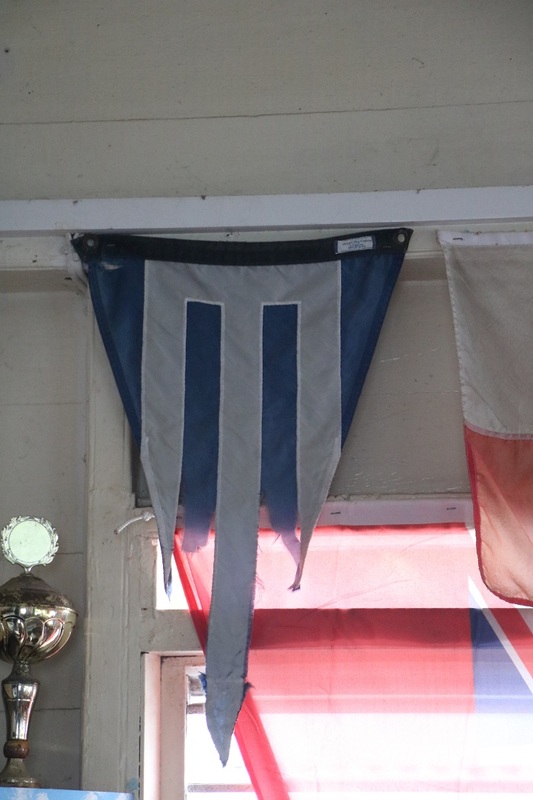 On a more humble note, I was surprised to see this tattered Essex Yacht Club burgee hanging in one of the local bars. I wonder if our club burgee came down to Bequia all the way from Essex CT on a member’s boat or if a member chartered chartering locally and flew it. 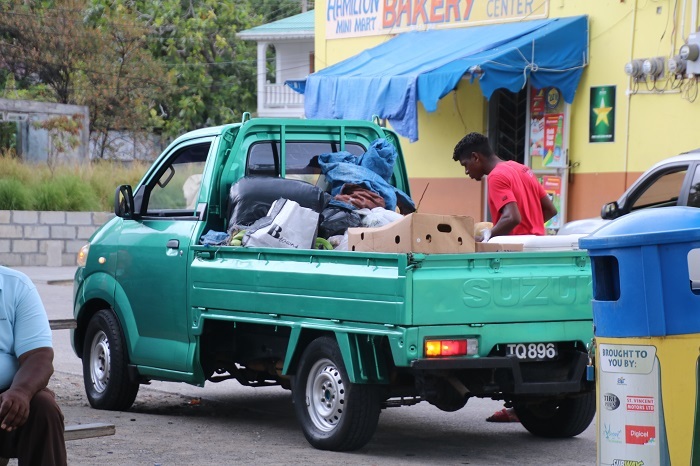 I’ll have to ask when we get back to CT.
And, finally, for those who follow this blog, you’ll recognize this Suzuki Carry truck below as similar to one that I have at home and use to get around town. Mine, new in 1992, is registered as an antique, and is more than 25 years old. I tried to explain why I have such a silly truck in this post. Doesn’t make sense to you? It still doesn’t to Brenda either. This one is fairly new and it’s not white. It’s still tiny though. It sure fits in here better than mine does sharing the roads with huge Ford F150s back in CT. Well, I guess that’s about all for now, an odd mix of stuff to be sure. 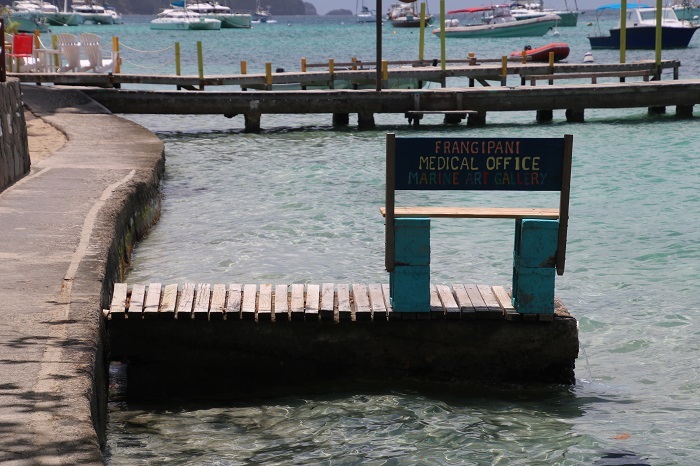 However, one thing that carries through, I hope, is that Bequia is the place to go if you are drawn to things made by people who take pride in their work. All that with the possible exception of a bird, a few yachts and an odd truck thrown in for good measure. And yes, for Pandora there’s still a Little Hope in all her new finery and I like that. Love the story of Hope and the chaps are special. Have tried to have a set made here to no avail.